Finally I am doing some yarn bombing. I was dying to do it: true. I was too lazy to start my own project: true. Luckily the Granby Park project came along. Granby Park is a pop-up park to open for one month on Dominick Street (Dublin 1) from 22nd August 2013. The park will feature Dublin’s creative talents and generally offer “a place of creativity, nature, imagination, play and beauty for everyone”. How exciting is this? This Granby Park is of course in need of some decoration and there has been a call for yarn fabric pieces to decorate the railings. Springwools (Walkinstown, Dublin) have set up a Facebook event page with practicalities regarding piece size, address to send them, etc. I was too happy to dig into my ridiculous stash and cast on yet an other project! I went for bright colours as it will surely look better on the railing than my usual neutrals and blues. 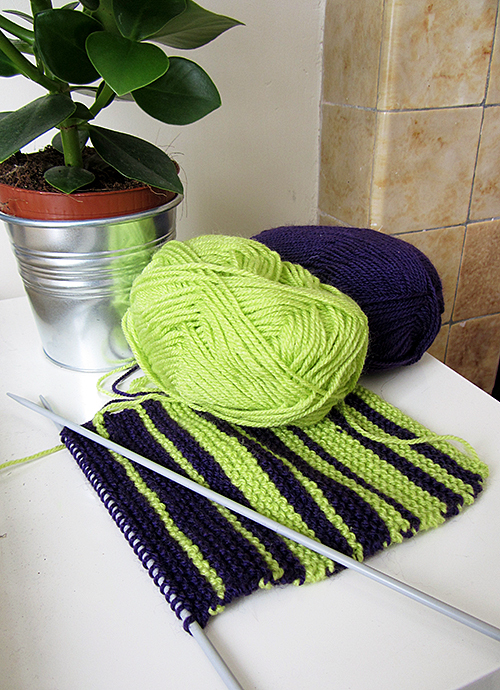 Neither the stitch or pattern are very fancy: this is your basic garter stitch with some two colours stripes. This is one of my kitchen projects: I work it whenever I have some free time in the kitchen, typically when something is cooking. Just as some people do mood scarves, this is a timer stripes pattern: I always start with a new colour and knit as long as I can until I have to stop because of some little person, sauce pan, barker, milkman, etc. When I can start again, I change colours. So far I have not been able to go further than 4 rows. I didn’t remember garter stitch was so good: it feels all bumpy under the fingers and would make a very comfy scarf. Something to keep in mind.